You’re frantically racing toward a deadline to complete a multi-page report or slideshow presentation, but research is slowing you down. Not tracking down the information so much as the constant bouncing between your work document and web browser, and cycling through the confusing morass of open tabs to find that webpage or image you need. 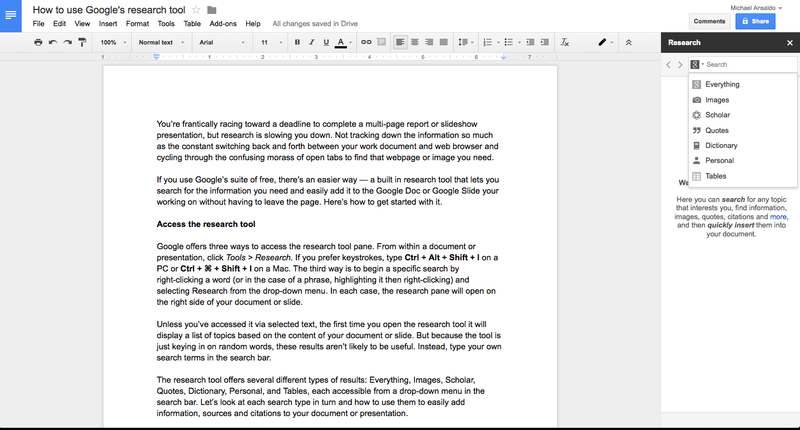 If you use Google’s free office suite, there’s an easier way—a built in research tool that lets you search for the information you need and easily add it to the Google Doc or Google Slide you’re working on without having to leave the page. Here’s how to get started. Google offers three ways to access the research tool pane. 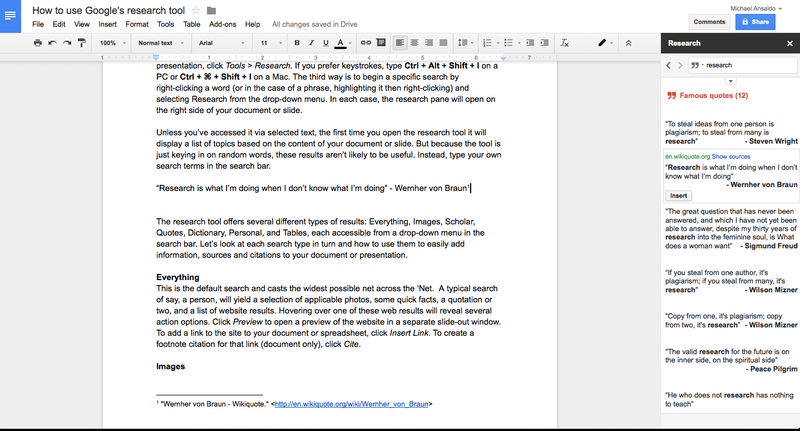 From within a document or presentation, click Tools > Research. If you prefer keystrokes, type Ctrl + Alt + Shift + I on a PC or Ctrl + ⌘ + Shift + I on a Mac. The third way is to begin a specific search by right-clicking a word (or in the case of a phrase, highlighting it then right-clicking) and selecting Research from the drop-down menu. In each case, the research pane will open on the right side of your document or slide. 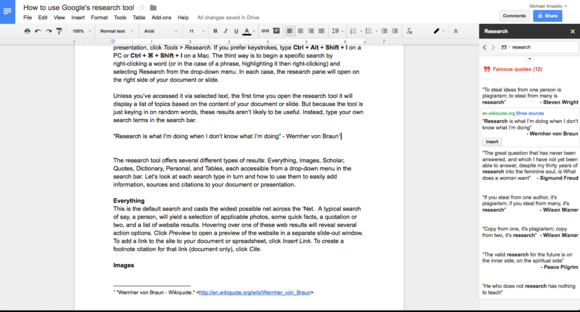 The research tool puts several different search filters right in the document or slideshow presentation you’re working on. Unless you’ve accessed it via selected text, the first time you open the research tool it will display a list of topics based on the content of your document or slide. But because the tool is just keying in on random words, these results aren’t likely to be useful. Instead, type your own search terms in the search bar. The research tool offers several different types of results: Everything, Images, Scholar, Quotes, Dictionary, Personal, and Tables, each accessible from a drop-down menu in the search bar. Let’s look at each search type in turn and how to use them to add information, sources and citations to your document or presentation. This is the default search and casts the widest possible net across the ‘Net. A typical search of say, a person, will yield a selection of applicable photos, some quick facts, a quotation or two, and a list of website results. Hovering over one of these web results will reveal several action options. Click Preview to open a preview of the website in a separate slide-out window. To add a link to the site to your document or spreadsheet, click Insert Link. To create a footnote citation for that link (document only), click Cite. To filter only image results, select Images from the drop-down menu in the search bar. 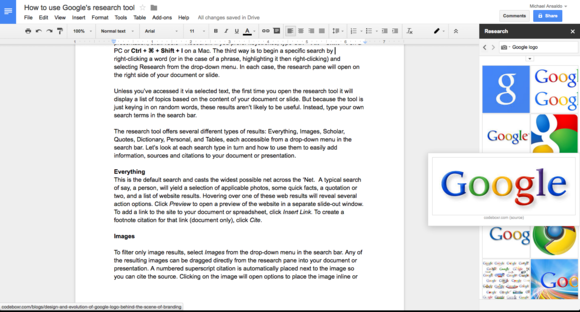 Any of the resulting images can be dragged directly from the research pane into your document or presentation. A numbered superscript citation is automatically placed next to the image so you can cite the source. Clicking the image will open options to place the image inline or wrap or break the text around it. In the case of the last two options, you’re also presented with a drop-down menu of preset margin widths/depths to choose from. Images can be added to your work right from the research pane. A Scholar search will troll Google Scholar for books, abstracts, peer-reviewed papers and other scholarly literature for information relevant to your search term. Results are presented as bibliographic entries. Click the accompanying link to open the actual publication in your web browser. To add the bibliographic information to your document, select Insert, and select Cite as footnote to add a citation. Select Quotes from the drop-down menu and enter either an individual’s name or a portion of a famous quote. When you mouse over a quotation result, you’re presented with a link to sources with more information on that quote. To insert the quote and its author in your document or spreadsheet, click Insert. It will automatically add a footnote citation as well. 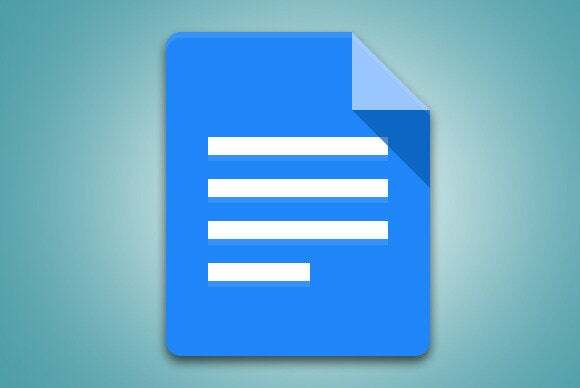 Google’s research tool makes it easy to add a quotation, its author and a footnote citation to your document. If you’re halfway through writing a report and realize you don’t remember the difference between “compose” and “comprise,” select Dictionary from the drop-down menu and enter one of the words in the search box. You’ll be supplied with definitions and synonyms from sources around the web. Sometimes the information you need is not out on the Web but rather buried somewhere in your Google Drive account. In that case, use this search option. Select Personal from the drop-down menu and enter your search term and the research tool will return results from your Docs, Sheets, and Slides, as well as images from your Picasa account and posts from your Google+ stream. Click Preview to glance at the content, and Insert Link to insert the item’s URL and title. Click Cite to add a footnote citation with the link (documents only). In the case of presentations, you can click Import Slides to choose slides to insert into your current presentation. To add table data to your document or spreadsheet, select Tables from the search box before conducting your search. By hovering over a result, you can click Preview to see a full-size preview image, Cite to create a footnote citation for the table in your document or spreadsheet, or Export to export the table into Google Sheets or Google Fusion Tables.